I’m James Ernest, game inventor. I’m best known as the president of Cheapass Games. I’ve been designing and publishing tabletop games for about 20 years. Some of my better-known titles include Kill Doctor Lucky, Lords of Vegas, Button Men, Give Me the Brain, Lord of the Fries, and Pirates of the Spanish Main. I also created the Pub Games for the RPG Fable II. (c) Cheapass Games. All rights reserved. Used with permission. 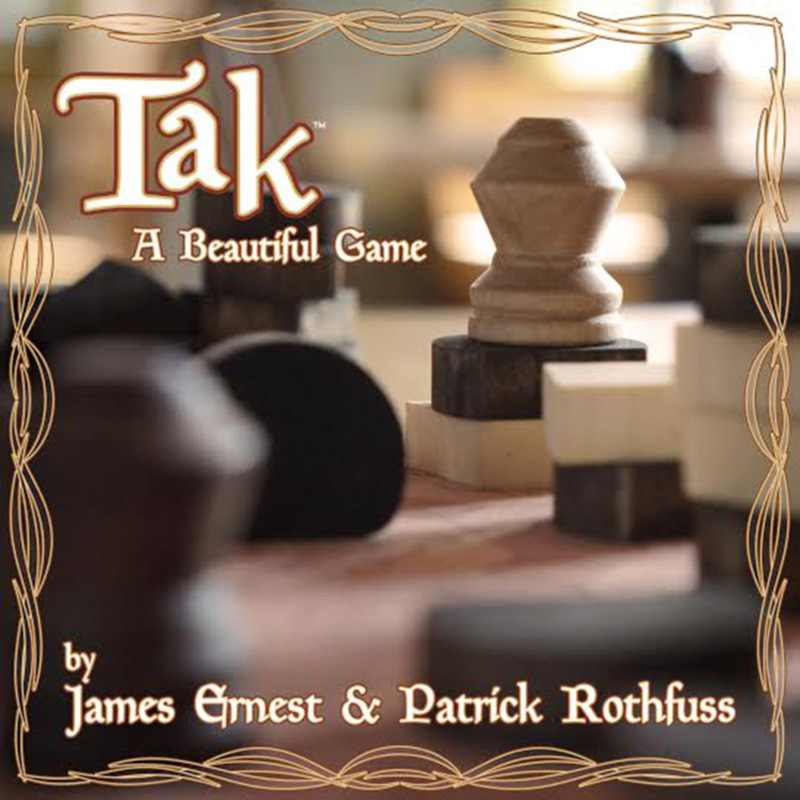 Tak is a 2-player abstract strategy game that was described in Patrick Rothfuss’ book, The Wise Man’s Fear. 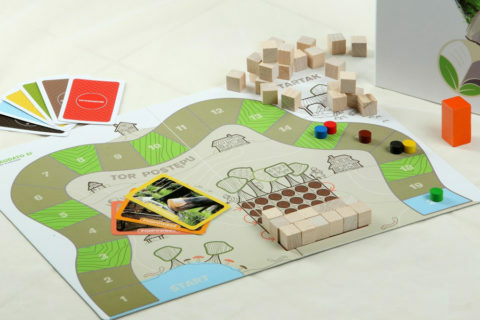 When Pat wrote the book, he didn’t have rules for the game, and he was careful to describe how good it was without giving away any of the rules. 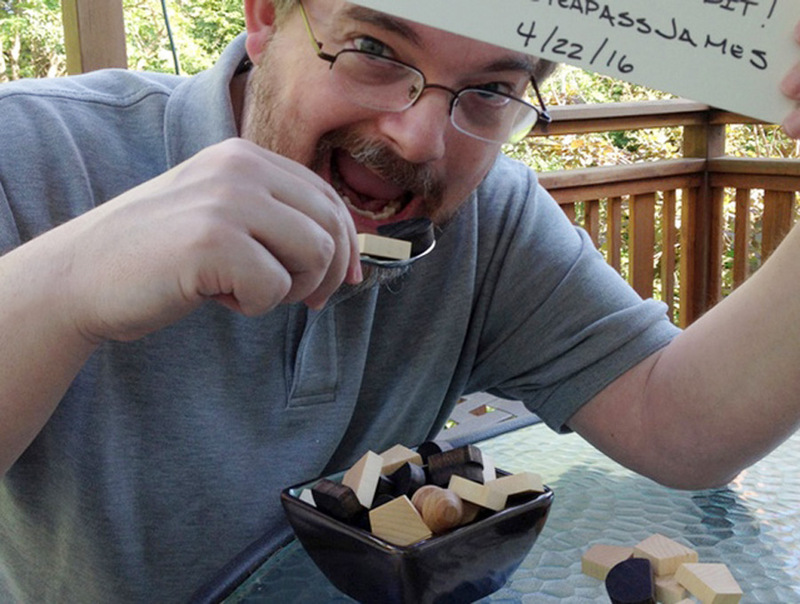 I worked with Pat on another game, Pairs, and during the Kickstarter campaign for that game we came up with the idea of creating rules for Tak. Pat was reluctant at first, because the assignment basically translated to “Make chess, but for me.” But I was persistent and after a few months of being nagged, Pat sent me everything he knew about the game. 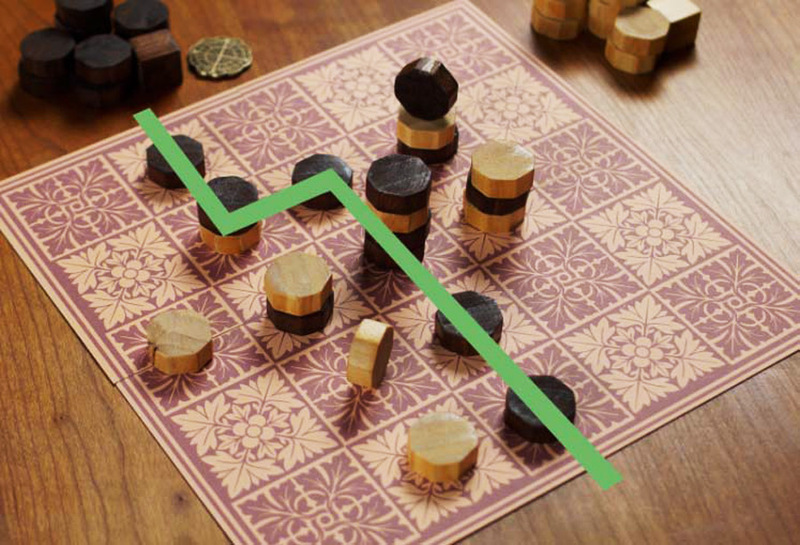 I really enjoy the challenge of creating abstract strategy games, but the challenge of selling them is even higher than that of writing them, so I rarely get the chance. Pat’s description included simple rules, stacking stones, road building, and pieces that combine in some way to make more powerful pieces. We ultimately accomplished this by having rules for stacking pieces, and moving stacks across the board to make roads. 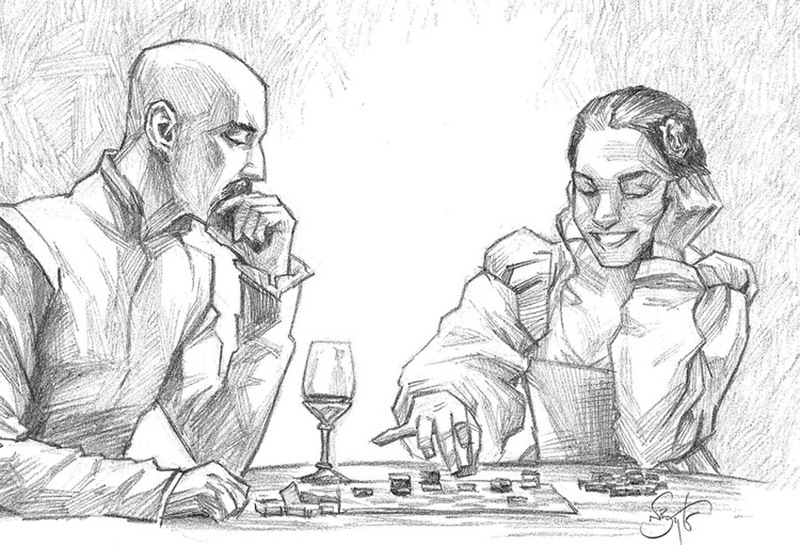 The goal is to join opposite sides of the board with a road of your pieces. 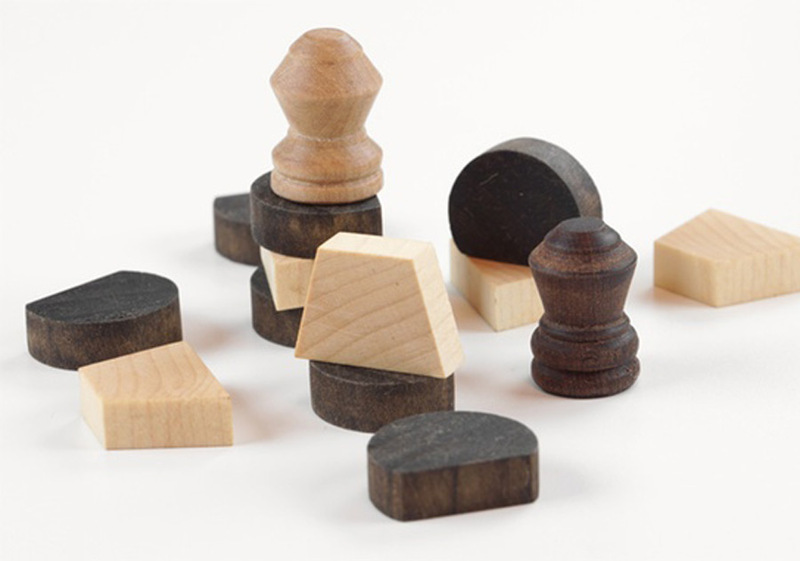 The pieces are simple: each player has several flatstones and one Capstone. 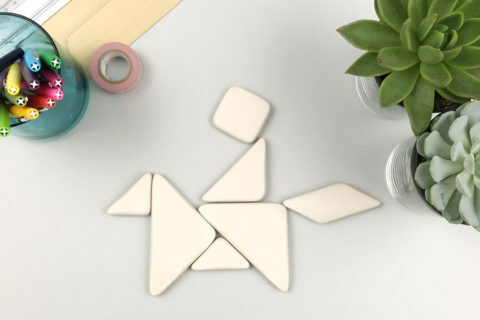 The flatstones can be laid flat, and stacked up, or they can be played standing up, in which case they can’t have another piece stacked on top of them. The Capstone is the power piece, and it can do many things including toppling a standing stone. The full rules have been in open beta for about six months, and we’ve attracted lots of players and even some software developers! Art by Nate Taylor. (c) Cheapass Games. All rights reserved. Used with permission. “Why designing non-digital games?” I prefer to call them just “games,” or perhaps “real games.” They really are a different animal from digital games. I worked in the digital space for years and it wasn’t my thing. My best achievements over there were adaptations of real games, like pub games and CCGs. The appeal of games has always been the social interaction, not the intellectual challenge, though it’s not bad when a game has both. I don’t feel as social when I play digital games and even when they are technically multiplayer they still feel like solitaire. 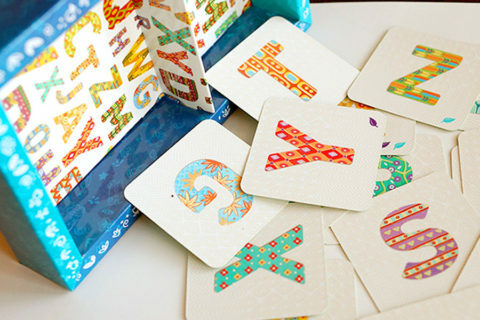 When I play, I want to play with friends, around a table, sharing stories and jokes. And that’s why real games are more appealing to me as a player. As a designer, I’ve focused on this discipline for so long that it comes easily. Publish 150 games and the same will happen for you. 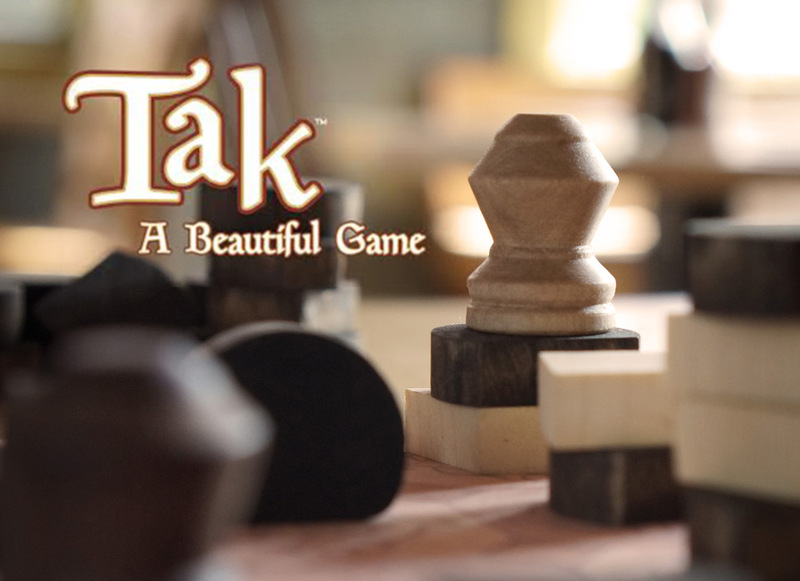 Tak is currently on Kickstarter and has raised over 400% of its funding goal. You can check out the campaign now or look for it in friendly local game stores in late 2016. Super excited for this game to come out! !